Why can’t I get a regular cleaning? Why can’t I just get a simple cleaning? Tooth decay and periodontal disease often have silent symptoms that go undetected. Regular checkups with your Hagerstown Dentist, Dr. Paul McAllister, are the best defense against decay and periodontal disease, saving you discomfort and money. Under state law, dentists (and only dentists) can diagnose gum disease prior to its treatment. There are four different types of “cleanings” available, all different in nature as well as cost. 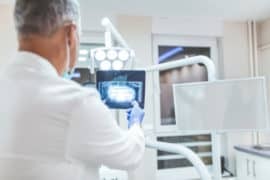 If the doctor has not thoroughly examined you prior to the hygienist cleaning your teeth, you can’t be sure you received the proper treatment. In summary, you may think you need a “simple cleaning” because that’s all you’ve ever had and you’re not experiencing any other problems. The reality is other problems may exist that were previously undetected or of which you were simply not aware due to the painless nature of the underlying disease. We take the necessary steps to diagnose your needs and then provide treatment accordingly. Ask questions every step of the way, we are in this together!